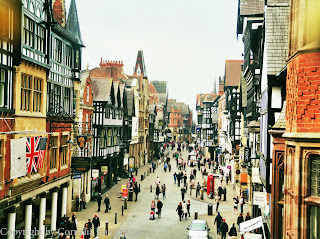 At a first glance, Chester looks like a small, old, English city. And yes, Chester is old and English but far from boring! 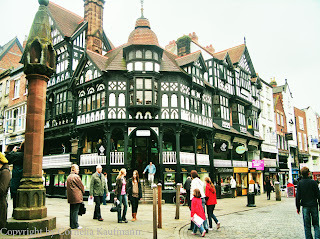 Founded by Romans and expanded especially during Tudor rule around the 15th to 17th century, Chester got it's very own charme. Probably the city's most striking features are "The Rows". The houses in the city centre have - next to the shops on street-level, a linked balconies on the first floor, which also feature shops and cafés. "Doubledecker Shopping" is what they call it, and it is a rather fitting description. Even in pouring rain, people can shop without getting soaked. Most of the inner-city architecture is Victorian, although it is made to look much older. The Rows are established in nearly every building along Chester's four main roads Watergate, Northgate, Eastgate and Bridge Street, which were already laid out in Roman times. The style of the houses has been called "black-andwhite-revival", as it returns to half-timbered walls. There are plenty of cafés and restaurants in the Rows, like The Rows Café which offers burgers, to the fancier restaurant/bistro Mezes. 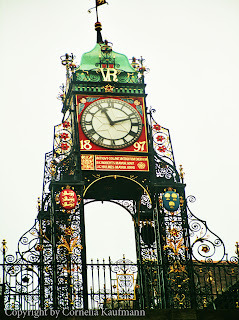 Chester is also home to the Eastgate Clock, the second most photographed clocktower in Great Britain after Big Ben. Eastgate Clock is on the city wall - Chester is the British city with most complete city walls. Those of you, who have ever wanted to try a really wicked milkshake, should head to Purely Wicked Milkshakes on Bridge Street. From KitKat flavour to popcorn and mango-strawberry red Bull smoothies, the menu features about 90 different flavours/ingredients. Chances are, there is one flavour that takes your fancy as well. Stroll along towards the river Dee and enjoy a pint at the Boathouse pub. 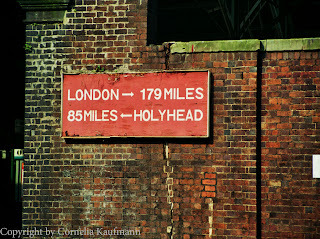 Or head into town for a drink and a meal at the Coach House Inn! Chester also offers the chance to encounter a Roman Centurio in full armour on the way to the Roman amphitheatre - in the middle of a medieval and Victorian style city.